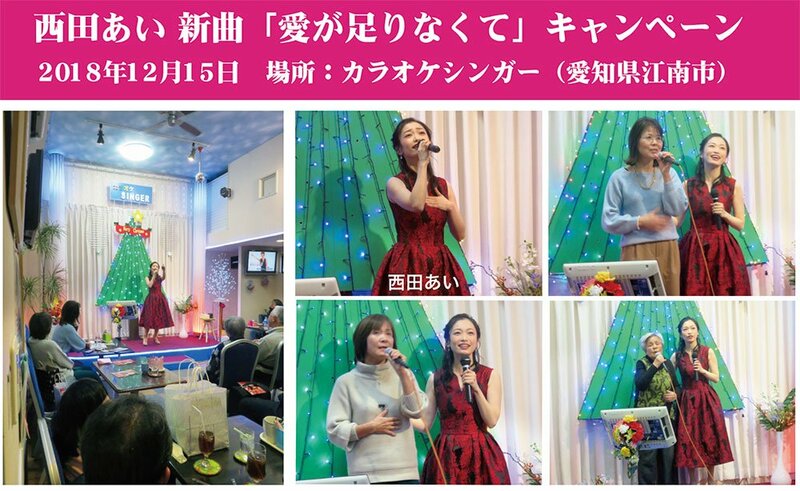 Nishida Ai, who appeared on numerous TV programs including NHK general TV "Utacon", came to a karaoke singer on December 15. From the debut of "Distant Fireworks" to the newest song "Lack of love", including songs covering "Blue Light Yokohama", they sang enthusiastically to show off the venue. Nishida Ai was 18 years old when he was aiming for a singer in his school days as a singer, accumulating lessons at Masaaki Hirao music school and mainly focusing on pops, "It is for your popular songs", Yamaguchi for the first time Listen to Momoe's "Playback part 2" and take shock. Then, knowing a lot of Showa Kayo, it is fascinated by the world of popular songs. In the audition held in 2008 which received the last in trying to give up the dream of the singer in the case of receiving a lot of audition, it is scouted in the eye of the record company. After coming up to Tokyo with a scout, after a year and a half of voice training, the dream came true on the day of July 7th, 2010, Tanabata ... "Yurare and far fireworks" debuted as a singer. She is such a career she is happy to be able to sing along with customers with new song "Love is not enough" released in August this year, "singing with a smile. As the new song "Love is not enough" and the coupling song "Tobenai Odoriko" will also have repeated melodies, once you hear it you can not forget it again. Both songs are composed of dramatic lyrics (lyrics poems: Fumiko Okada) and a light melody (composition / arrangement: Tetsushi Hayashi). "It is best to sing pleasantly lightly" she told me. In addition to the wonderfulness of her singing ability, I was pleased to say that guests enjoyed themselves very much. It was such a fun campaign.